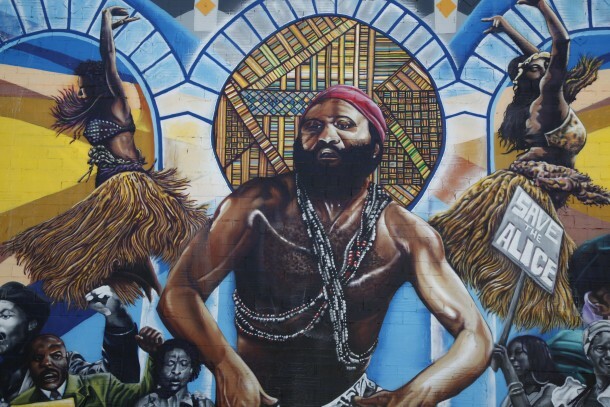 Acclaimed muralist collective Community Rejuvenation Project (CRP) has announced a crowdfunding campaign to help complete the documentary “Alice Street.” The organization is looking to raise at least $12,000 by July 25, $8000 of which will be matched by the East Bay Community Foundation’s East Bay Fund for Artists. In conjunction with the announcement of the crowdfunding campaign, CRP also announced the launch of AliceStreetFilm.com and the latest trailer for the documentary. Sponsorship packages, which range from a $25 mug to a $1000 personal portrait, are here. “Alice Street” Documentary Trailer from Endangered Ideas on Vimeo. The film is slated for completion later this year, and expected to be entered into festivals around the country in 2016-2017. 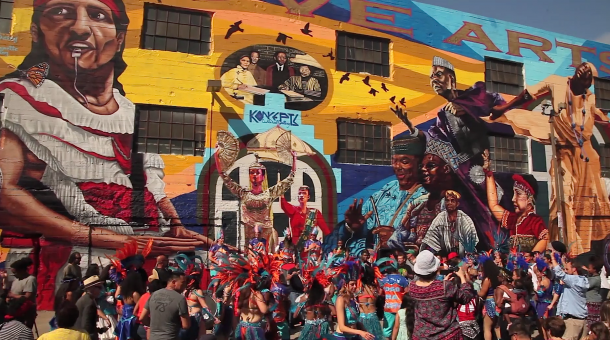 Directed by Spencer Wilkinson, and produced by CRP and Endangered Ideas, “Alice Street” follows the epic story of a historic mural from the beginning to the last gavel strike of Oakland’s Planning Commission, presenting a window into the intersection of cultural resiliency and the impacts of gentrification. The story revolves around two muralists, Pancho Peskador and Desi Mundo, who take on a commission to paint a large mural project at the intersection of Alice and 14th. Sts. in downtown Oakland – a location which becomes ground-zero for the gentrification wave threatening to displace longtime residents and erase community and neighborhood history. The project itself derives its artistic inspiration from two different cultures which intersect the mural site: the Chinese-language community of the Hotel Oakland, and the Afro-Diasporic community centered around the Malonga Casquelourd Center for the Arts. The muralists’ creative process involves community engagement through interviews with neighborhood residents, culture-keepers, and historians, who reveal the largely-unknown history of the location site, and the cultural resiliency in the face of threatened displacement which has been a hallmark of both communities. Tension arises, however, in the form of internal dynamics among these communities, a racist NIMBY neighbor, a developer who plans a 37-story project on one of the mural walls, and ultimately, another developer who plans to turn the entire mural site into a high-rise, market-rate housing complex. Meanwhile, the Oakland community organizes against gentrification and displacement, turning the mural itself into a symbol of the themes it embodies visually. 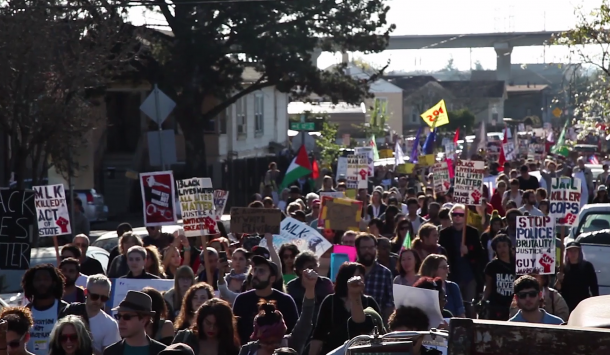 The documentary raises important questions about the need to preserve arts and culture in the face of population shift and economic turnover – a phenomenon which is not unique to Oakland – and whether it’s even possible to slow the tide of gentrification, once it’s begun. A full synopsis is here.